What: The Wharton School is pleased to invite business journalists to apply for the Penn Wharton Public Policy Scholarship which will allow up to five business reporters who cover aspects of public policy either domestically or internationally to attend the Wharton Seminars for Business Journalists flagship program in Philadelphia this year. Each scholarship covers the cost of tuition, course materials, most group meals, lodging for three nights and airfare within the US (where appropriate). In addition, accepted journalists may request private, one-on-one meetings with faculty members of the Penn Wharton Public Policy Initiative. The scholarship does not cover any other expenses. Other restrictions may apply. The Wharton Seminars for Business Journalists, now in its 48th year, offers participants an opportunity to expand their business knowledge and increase their exposure to leading experts in a stimulating environment. 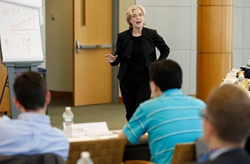 Through intensive lectures and hands-on exercises, the program, led by the Wharton School’s most prominent professors, helps participants gain a better understanding of key business and economic issues. Besides the Penn Wharton Public Policy Scholarship, numerous other financial aid options are available for reporters interested in attending the Seminars. To learn more visit the Seminars financial aid page. When: Program runs October 8-11, 2016. The Penn Wharton Public Policy Scholarship deadline is September 9; other deadlines vary by scholarship. Non-scholarship applications are due by September 21, 2016. How: Registration is required to attend this program. Visit the Seminar application page. Founded in 1881 as the first collegiate business school, the Wharton School of the University of Pennsylvania is recognized globally for intellectual leadership and ongoing innovation across every major discipline of business education. With a broad global community and one of the most published business school faculties, Wharton creates ongoing economic and social value around the world. The School has 5,000 undergraduate, MBA, executive MBA, and doctoral students; more than 9,000 annual participants in executive education programs; and a powerful alumni network of more than 95,000 graduates.